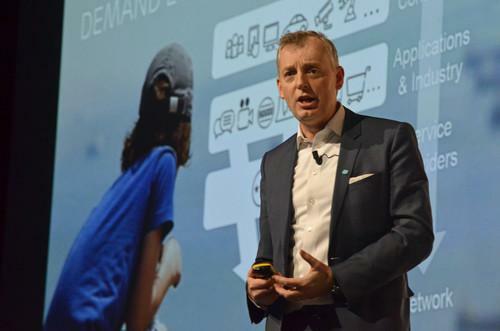 Ericsson Group CTO Ulf Ewaldsson spoke on Wednesday at Mobile World Congress in Barcelona. Net neutrality and 5G may be on a collision course as the mobile industry tries to prepare for a wide range of mobile applications with differing needs. The net neutrality rules passed by the U.S. Federal Communications Commission last week have raised some eyebrows at Mobile World Congress this week. The full text of the rules isn't public yet, but mobile movers and shakers are having their say. The latest questions involve 5G, the next-generation standard that everyone here is trying to plan for. The most common thing they think 5G will have to do is to serve a lot of different purposes. Regulators' attempts to ban "fast lanes" and other special treatment might make that impossible, people who've been thinking about 5G said Wednesday. Industrial sensors, self-driving cars and other emerging uses of the Internet have needs that can't be met by a general-purpose network, Ericsson Group CTO Ulf Ewaldsson said during a panel discussion. That's driving a global discussion on a so-called "industrial Internet" alongside the regular Internet that's grown up around the Web and other consumer activities, he said. Regulatory efforts like the FCC's rules don't see a distinction, Ewaldsson said. He didn't slam the agency for this but said the mobile industry needs to do a better job of explaining what it's trying to do. Most importantly, it's not trying to block or throttle people's access to the Internet, he said. On Monday at the show, FCC Chairman Tom Wheeler said the Internet needs a referee to determine what's "just and reasonable." That gives hope to Balasz Bertenyi, who leads part of the technical specifications group in the 3GPP, which will play a key role in 5G. He said there are already mechanisms in 4G to make sure voice calls get the right quality of service, so special treatment for special kinds of traffic are likely to be allowed. However regulators may look at it, something will have to be done if 5G is going to serve all mobile needs, said Chaesub Lee, director of the International Telecommunication Union's Standardization Bureau. Today, all traffic is defined as either broadband or not, he said. "Our treatment of traffic is not smart enough to support all the business models," Lee said. There's such a thing as too broad a standard, Ericsson's Ewaldsson said. He hopes 5G leaves some mobile applications to others. "One risk with 5G is that we're stretching it too wide to be able to build it," he said. For example, it may not be possible to include ultra-low-power IoT devices that can never be charged, he said. "We still haven't fulfilled all the requirements of 4G, either," Ewaldsson said. "We said one gigabit for the downlink, and last time I checked here in Barcelona, I didn't get that."